Hi everyone. We were so busy at the new house this week that we didn't get to go thrifting at all. However, we still have some finds to report from last week. On that thrifting run, I actually took along my "good luck charm" ... my mom! It could be coincidence but I often come across quite a few goodies while out at the thrifts with her. 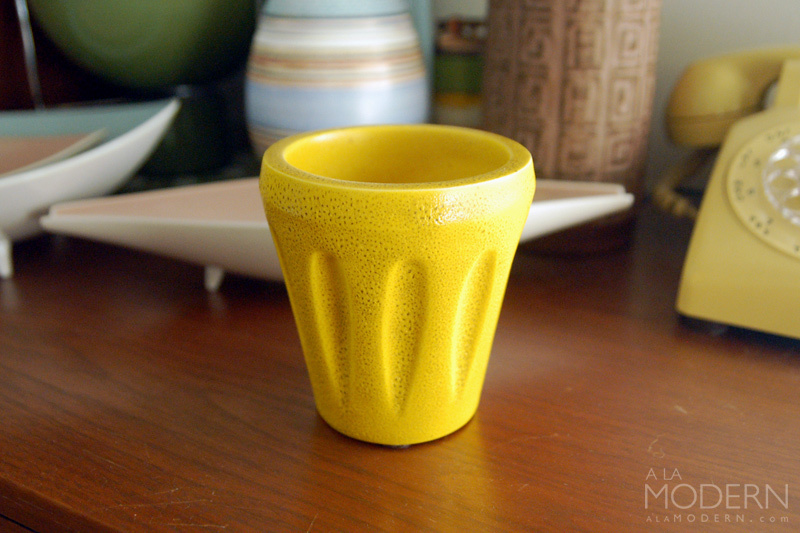 This unusual Freeman McFarlin flowerpot has a weird yellow "lava"-like glaze. It almost looks West German, or perhaps like a Jaru piece. Missing the sticker, but I recognized it easily from the "Anthony" script name on the bottom (Maynard Anthony Freeman was one of the founders). I often pass up FMcF because the items seem more on the 70s "gaudy" side to me. This Naaman penguin found its way into the basket even though I didn't know what it was at the time. It had a modern look to it, and mom agreed it looked nice. Took me quite awhile to find out who it was by - Naaman is a ceramics company from Israel that's still producing today. 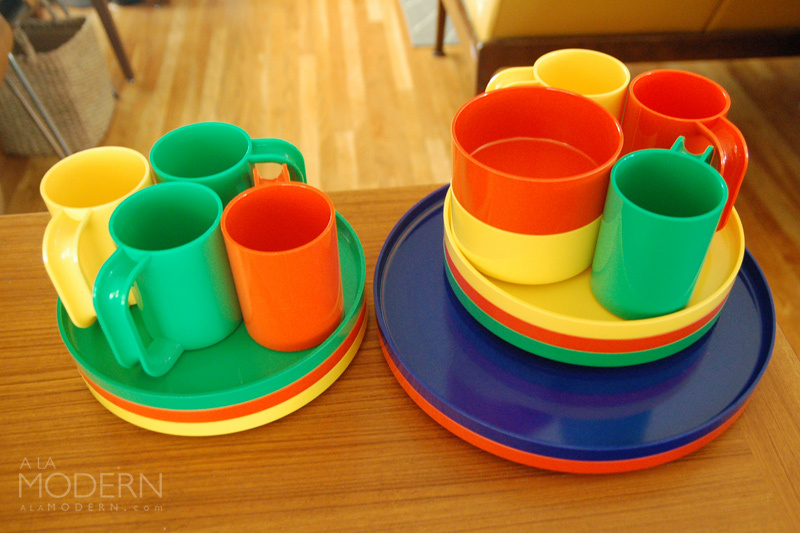 This large haul of Heller plastic by Vignelli came from a combination of different thrifts. Mom was not as impressed with these plastic dinnerware pieces, until I explained that they were collectibles. I was most happy about finding the larger platters which are harder to come by. 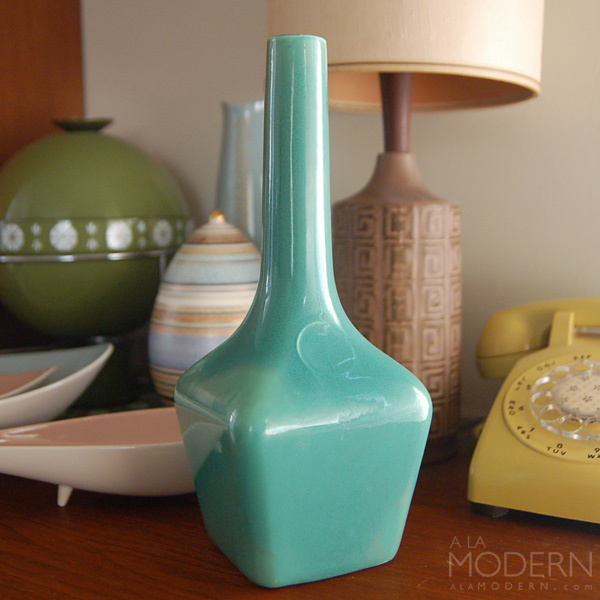 I picked up this pottery bottle or vase because I liked the green glaze... 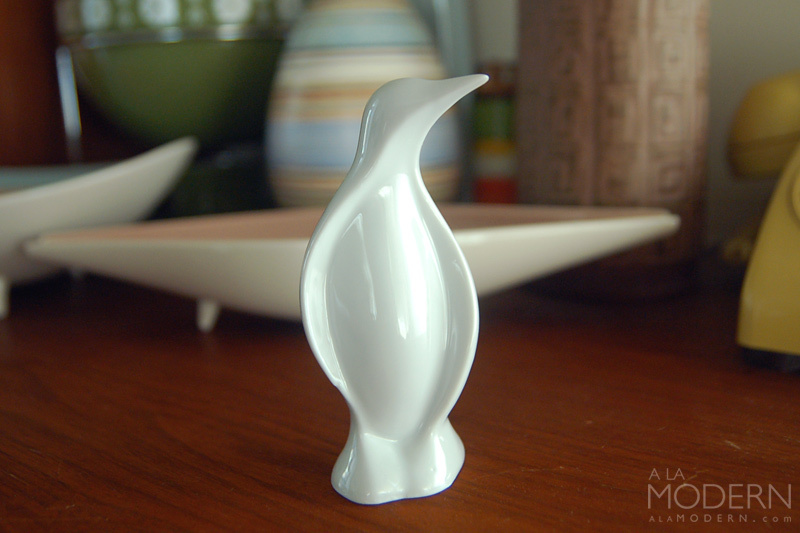 I'm not sure about which company it's from, but it reminds me of one of the California potteries. Has a strange little circle indentation on the front, like a label was supposed to go there. It has some weird glaze issues too, so we might keep it. Unmarked except for a raised number "103" - anyone have ideas? Mom was also surprised that these Taylor & Ng mugs were collectible, since they looked fairly new. 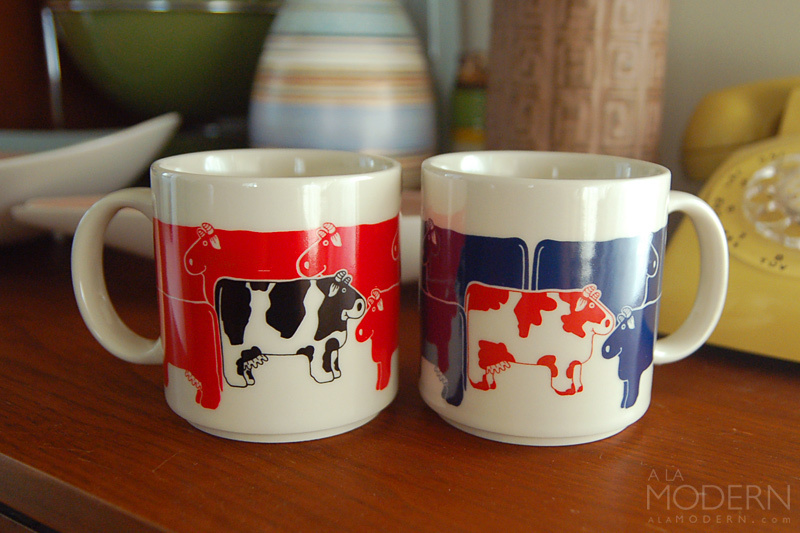 I haven't come across these before - the design is called "Dairy Dearies". They're a little newer than some of the other Taylor & Ng pieces we come across, likely late 80s. At the same thrift, I couldn't believe this Cathrineholm plate was still sitting there. Mom said she also noticed this plate before I did, though she wasn't certain about it. 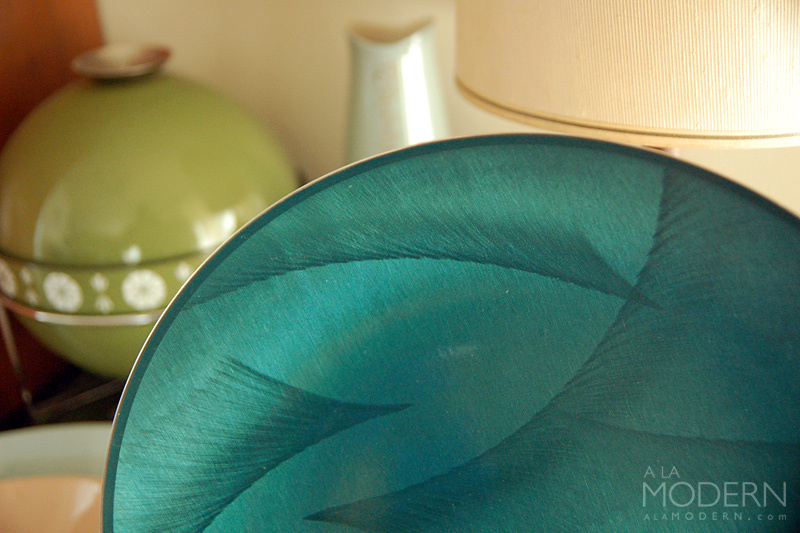 It's also not the more popular "Lotus" pattern, but I'll pretty much grab any Cathrineholm as long as it's reasonable. 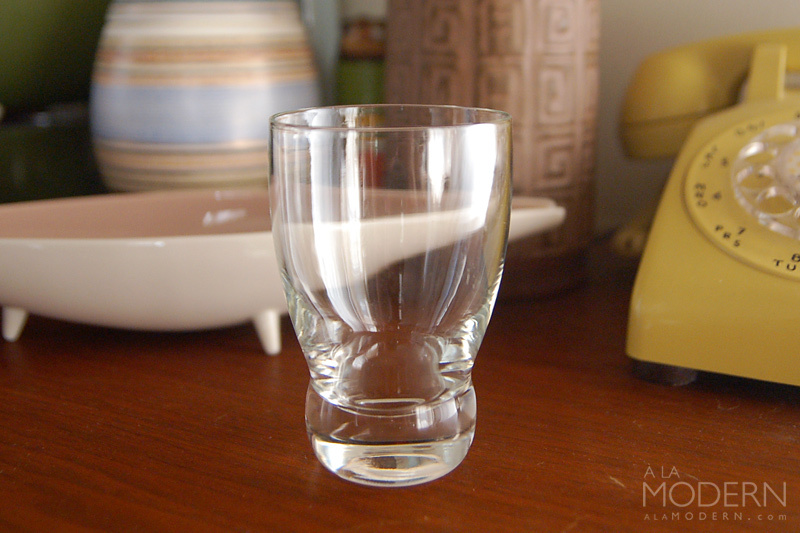 I only found one of these Eva Zeisel designed juice glasses. This "Prestige" line was made for Federal Glass. Though unmarked, you can often identify them by the extremely heavy "doorknob" bottom. This is only the second time I've come across them, and I believe this "un-swirled" variety is harder to find. I only wish I found more - Mom looked through all the shelves twice to check, but no luck. This is only the second time I've come home with any Blenko. 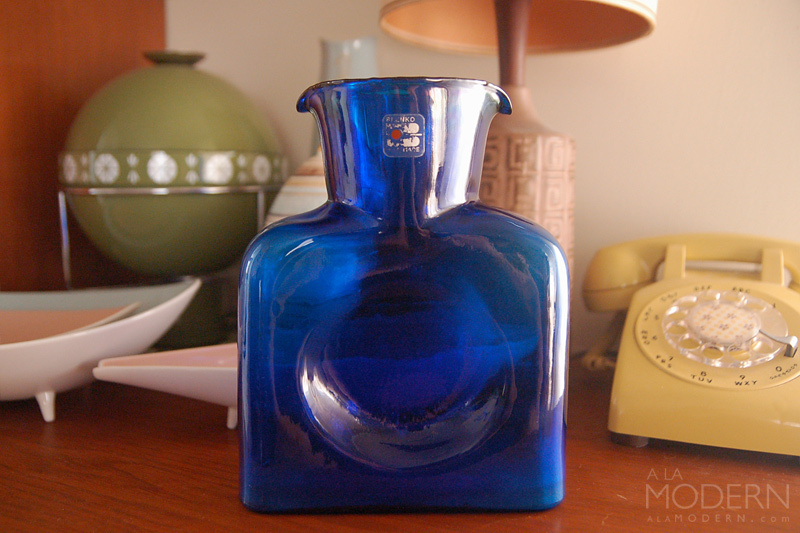 For some reason, it seems hard to thrift this type of glass at stores near us - but it could also be that I'm not looking for it or just not recognizing it. This water bottle was easily identified though, because it still had a sticker. I saved our best find for last. 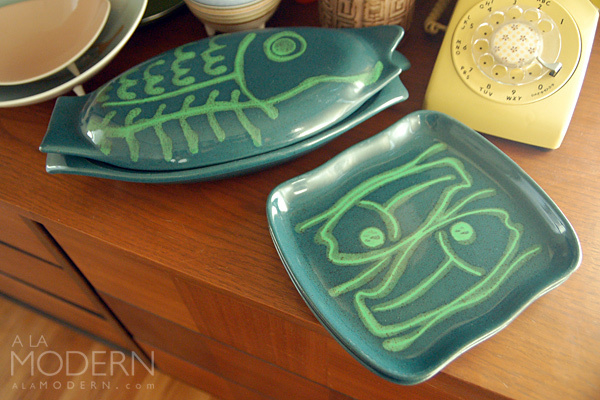 I was distracted and checking something on my iPhone, when I looked down and these Glidden Pottery fish items were just sitting on the bottom shelf. I think I actually exclaimed "Holy Sh@#%^" out loud! We so rarely find Glidden out in the wild, and I recognized the pattern immediately from seeing it in an antique store. My mom actually liked Glidden dishes so much that she almost didn't want me to put them up in the shop. And we actually haven't yet, because they aren't worth quite as much as I thought they might be. OK, hopefully we'll be able to get out for more thrifting next week. Hope you've had good luck finding things too!